Pitchers and Poets - Cursed To First - Sox and Pats forever. Well. The Baltimore Orioles certainly seem to be precisely what the doctor ordered this weekend, didn't they? I missed most of the games, including the big comeback Friday night, when I was on a plane to Ohio to go to a party for my sister's graduation. I also missed all but highlights of Saturday's game while I was at said party, and Marathon Monday is a work day for me, so the only game I actually sat down and watched was Jon Lester's start on Sunday, which I'll get to shortly. The other games, I absorbed through the strange Red Sox osmosis that takes over when I'm away from Boston. I didn't see one pitch of Friday's game -- still haven't -- but when I landed in Columbus there were score text messages that showed the progression from 7-0 to 7-1 to 7-4, 7-5, 8-5, 8-8...and another text from my friend Andy, watching at a bar in Cambridge, saying, "Wow, we pulled that game out of our asses, huh?" The next day, ditto on the score updates. Finally, as the time neared midnight, we waited patiently through basketball playoff highlights (go C's!) and the scroll of NL scores for highlights from the Sox game, which I already knew they'd won, 6-4. "But who gave up all the runs?" I kept demanding of the television, knowing that Josh had kept a goose egg on the board for at least the early innings, picturing a Manny Delcarmen experience that accounted for the close score. Instead, it was Josh who gave them up, leaving his start Saturday a little more of a question mark than it might've been if he'd kept up the asskickery for a little longer. Speaking of asskickery, I also saw Kevin Youkilis absolutely going off at the plate in the highlights from Saturday, going 4-5, a triple short of the cycle and driving in four of the Boston runs. His bounding single up the middle to plate two runs in the fourth inning was a thing of beauty. Papi, I found out later, got an opposite-field triple to score two runs, a bit like hearing that Punxsutawney Phil has not seen his shadow. I never felt very far from the Sox this weekend, and it wasn't just because of the score updates and Sportscenter. It's also because when you travel through Logan Airport, or anywhere in Boston in-season, the Red Sox are woven through everything, every moment, every encounter. Take our connecting flight on the way back, which took off from Washington DC. The flight attendant making the pre-takeoff announcements on said "Red Sox Nation" whenever she would otherwise have said Boston. Meanwhile, I'd passed a gentleman in first class on my way to steerage who was wearing a Yankees cap, this not 24 hours after his team had been crushed by the Cleveland Indians, 22-4. We were spat out of the jetway back at Logan's Terminal B into a crowd of people waiting to take off for school vacation week. We hadn't been on terra firma in Boston for longer than 30 seconds when I heard a woman's voice behind me out of the crowd yelling, "GOOOO RED SOX!!" It's still sometimes hard to explain to people who have never had this experience just what the Red Sox are around here, what they mean. If I'd been able to pick just one game to get to see all the way through in advance, it would've been Sunday's taut pitchers' duel between Jon Lester and Koji Uehara, whose description by Mike Lowell has stuck with me since: "He throws out of his ear." Uehara's deceptive pitching was impressive--somewhat remeniscent of Pedro in the way he flicks his wrist back after delivering the ball--but Jon Lester was in full Josh Beckett Clone mode. Lester's velocity has remained consistent through his first two rough starts, but he's shown a distressing lack of command. That returned with a vengeance Sunday; where Lester has been up in the zone with hanging meatballs, Sunday he climbed the ladder. Where he's missed down and away with his breaking pitches, on Sunday he was painting the corner. I was reminded, watching this steely effort from Lester, of the Robert Frost quote, "Poets are like baseball pitchers. Both have their moments. The intervals are the tough things." And sometimes, with a pitcher, it can feel like an entire lifetime has come and gone in a single inning--witness the nail-biting performance of Takashi Saito in the ninth on Sunday. He didn't preserve the shutout, but saved the win, pumping his fist in a way that was eerily remeniscent of Hideki Okajima's breakout performance against the Yankees almost exactly two years ago. 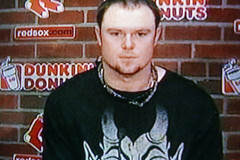 Speaking of eerily remeniscent...out of all my Sox moments over this past weekend, my favorite was watching Jon Lester's press conference on Sunday evening. And then, I kid you not, he said "execute pitches."